The amino sugar attached through a glycosidic link to C-5 is desosamine, a structure found in several other macrolide antibiotics. The tertiary amine of desosamine (3,4,6-trideoxy-3-dimethylamino-d-xylo-hexose) confers a basic character to erythromycin and provides the means by which acid salts may be prepared. The other carbohydrate structure linked as a glycoside to C-3 is called cladinose (2,3,6-trideoxy-3-methoxy-3-C-methyl-l-ribo-hexose) and is unique to the erythromycin molecule. As is common with other macrolide antibiotics, compounds closely related to erythromycin have been obtained from culture filtrates of S. erythraeus. Two such analogs have been found, erythromycins B and C. Erythromycin B differs from erythromycin A only at C-12, at which a hydrogen has replaced the hydroxyl group. The B analog is more acid stable but has only about 80% of the activity of eryth-romycin. The C analog differs from erythromycin by the replacement of the methoxyl group on the cladinose moiety with a hydrogen atom. It appears to be as active as erythro-mycin but is present in very small amounts in fermentation liquors. Erythromycin is a very bitter, white or yellow-white, crystalline powder. It is soluble in alcohol and in the other common organic solvents but only slightly soluble in water. The free base has a pKa of 8.8. Saturated aqueous solutions develop an alkaline pH in the range of 8.0 to 10.5. It is extremely unstable at a pH of 4 or below. The optimum pH for stability of erythromycin is at or near neutrality. Erythromycin may be used as the free base in oral dosage forms and for topical administration. To overcome its bitterness and irregular oral absorption (resulting from acid destruction and adsorption onto food), various enteric-coated and delayed-release dose forms of erythromycin base have been developed. These forms have been fully successful in overcoming the bitterness but have solved only marginally problems of oral absorption. Erythromycin has been chemically modified with primarily two different goals in mind: (a) to increase either its water or its lipid solubility for parenteral dosage forms and (b) to increase its acid stability (and possibly its lipid solubility) for improved oral absorption. 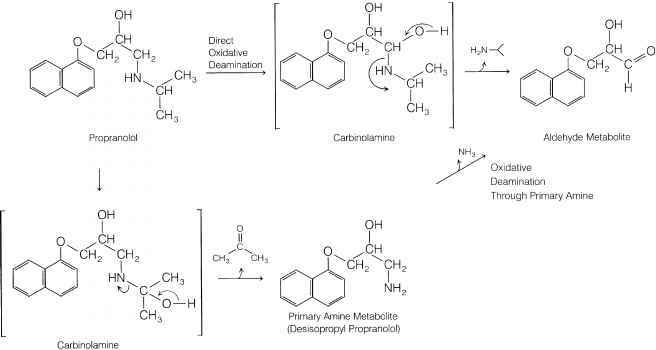 Modified derivatives of the antibiotic are of two types: acid salts of the dimethylamino group of the desosamine moiety (e.g., the glucoheptonate, the lac-tobionate, and the stearate) and esters of the 2'-hydroxyl group of the desosamine (e.g., the ethylsuccinate and the propionate, available as the lauryl sulfate salt and known as the estolate). The stearate salt and the ethylsuccinate and propionate esters are used in oral dose forms intended to improve absorption of the antibiotic. The stearate releases erythromycin base in the intestinal tract, which is then absorbed. The ethylsuccinate and the estolate are absorbed largely intact and are hydrolyzed partially by plasma and tissue esterases to give free erythromycin. The question of bioavailability of the antibiotic from its various oral dosage and chemical forms has caused considerable concern and dispute over the past two decades.200-205 It is generally believed that the 2'-esters per se have little or no intrinsic antibacterial activ-ity206 and, therefore, must be hydrolyzed to the parent antibiotic in vivo. Although the ethylsuccinate is hydrolyzed more efficiently than the estolate in vivo and, in fact, provides higher levels of erythromycin following intramuscular administration, an equal dose of the estolate gives higher levels of the free antibiotic following oral administra-tion.201,205 Superior oral absorption of the estolate is attributed to its both greater acid stability and higher intrinsic absorption than the ethylsuccinate. Also, oral absorption of the estolate, unlike that of both the stearate and the ethylsuccinate, is not affected by food or fluid volume content of the gut. Superior bioavailability of active antibiotic from oral administration of the estolate over the ethylsuccinate, stearate, or erythromycin base cannot necessarily be assumed, however, because the estolate is more extensively protein bound than erythromycin itself.207 Measured fractions of plasma protein binding for erythromycin-2'-propionate and erythromycin base range from 0.94 to 0.98 for the former and from 0.73 to 0.90 for the latter, indicating a much higher level of free erythromycin in the plasma. Bioavailability studies comparing equivalent doses of the enteric-coated base, the stearate salt, the ethylsuccinate ester, and the estolate ester in human volunteers203,204 showed delayed but slightly higher bioavailability for the free base than for the stearate, ethylsuccinate, or estolate. The water-insoluble ethylsuccinate ester is also available as a suspension for intramuscular injection. The gluco-heptonate and lactobionate salts, however, are highly water-soluble derivatives that provide high plasma levels of the active antibiotic immediately after intravenous injection. Aqueous solutions of these salts may also be administered by intramuscular injection, but this is not a common practice. Erythromycin is distributed throughout the body water. It persists in tissues longer than in the blood. The antibiotic is concentrated by the liver and excreted extensively into the bile. Large amounts are excreted in the feces, partly because of poor oral absorption and partly because of biliary excretion. The serum half-life is 1.4 hours. Some cytochrome P450-catalyzed oxidative demethylation to a less active metabolite may also occur. 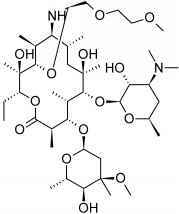 Erythromycin inhibits cytochrome P450-requiring oxidases, leading to various potential drug interactions. Thus, toxic effects of theo-phylline, the hydroxycoumarin anticoagulants, the benzodi-azepines alprazolam and midazolam, carbamazepine, cy-closporine, and the antihistaminic drugs terfenadine and astemizole may be potentiated by erythromycin. The toxicity of erythromycin is comparatively low. Primary adverse reactions to the antibiotic are related to its actions on the GI tract and the liver. Erythromycin may stimulate GI motility following either oral or parenteral ad-ministration.211 This dose-related, prokinetic effect can cause abdominal cramps, epigastric distress, and diarrhea, especially in children and young adults. Cholestatic hepatitis occurs occasionally with erythromycin, usually in adults and more frequently with the estolate. Erythromycin stearate (Ethril, Wyamycin S, Erypar) is the stearic acid salt of erythromycin. 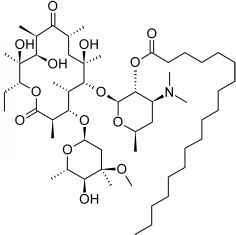 Like erythromycin base, the stearate is acid labile. It is film coated to protect it from acid degradation in the stomach. In the alkaline pH of the duodenum, the free base is liberated from the stearate and absorbed. Erythromycin stearate is a crystalline powder that is practically insoluble in water but soluble in alcohol and ether. Erythromycin ethylsuccinate (EES, Pediamycin, EryPed) is the ethylsuccinate mixed ester of erythromycin in which the 2'-hydroxy l group of the desosamine is esterified. It is absorbed as the ester and hydrolyzed slowly in the body to form erythromycin. It is somewhat acid labile, and its absorption is enhanced by the presence of food. The ester is insoluble in water but soluble in alcohol and ether. Erythromycin estolate, erythromycin propionate lauryl sulfate (Ilosone), is the lauryl sulfate salt of the 2'-propionate ester of erythromycin. 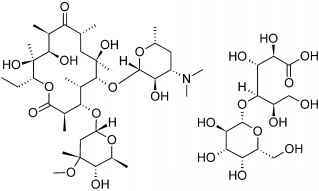 Erythromycin estolate is acid stable and absorbed as the propionate ester. The ester undergoes slow hydrolysis in vivo. Only the free base binds to bacterial ribosomes. Some evidence, however, suggests that the ester is taken up by bacterial cells more rapidly than the free base and undergoes hydrolysis by bacterial esterases within the cells. The incidence of cholestatic hepatitis is reportedly higher with the estolate than with other erythromycin preparations. 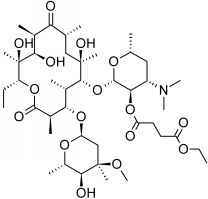 Erythromycin estolate occurs as long needles that are sparingly soluble in water but soluble in organic solvents. Erythromycin gluceptate, erythromycin glucoheptonate (Ilotycin Gluceptate), is the glucoheptonic acid salt of erythromycin. It is a crystalline substance that is freely soluble in water and practically insoluble in organic solvents. Erythromycin gluceptate is intended for intravenous administration for the treatment of serious infections, such as Legionnaires disease, or when oral administration is not possible. Solutions are stable for 1 week when refrigerated. Erythromycin lactobionate is a water-soluble salt prepared by reacting erythromycin base with lactobiono-^-lactone. It occurs as an amorphous powder that is freely soluble in water and alcohol and slightly soluble in ether. It is intended, after reconstitution in sterile water, for intravenous administration to achieve high plasma levels in the treatment of serious infections. Clarithromycin is well absorbed following oral administration. 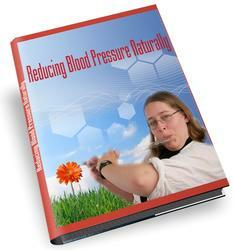 Its oral bioavailability is estimated to be 50% to 55%. The presence of food does not significantly affect its absorption. Extensive metabolism of clarithromycin by oxidation and hydrolysis occurs in the liver. 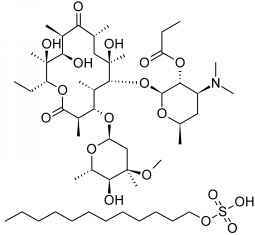 The major metabolite is the 14-hydroxyl derivative, which retains antibacterial activity. The amount of clarithromycin excreted in the urine ranges from 20% to 30%, depending on the dose, whereas 10% to 15% of the 14-hydroxy metabolite is excreted in the urine. Biliary excretion of clarithromycin is much lower than that of erythromycin. Clarithromycin is widely distributed into the tissues, which retain much higher concentrations than the plasma. Protein-binding fractions in the plasma range from 65% to 70%. The plasma half-life of clarithromycin is 4.3 hours. Some of the microbiological properties of clarithromycin also appear to be superior to those of erythromycin. It exhibits greater potency against M. pneumoniae, Legionella spp., Chlamydia pneumoniae, H. influenzae, and M. ca-tarrhalis than does erythromycin. Clarithromycin also has activity against unusual pathogens such as Borrelia burgdorferi (the cause of Lyme disease) and the Mycobacterium avium complex (MAC). Clarithromycin is significantly more active than erythromycin against group A streptococci, S. pneumoniae, and the viridans group of streptococci in vivo because of its superior oral bioavailability. Clarithromycin is, however, more expensive than erythromycin, which must be weighed against its potentially greater effectiveness. Adverse reactions to clarithromycin are rare. The most common complaints relate to GI symptoms, but these seldom require discontinuance of therapy. Clarithromycin, like erythromycin, inhibits cytochrome P450 oxidases and, thus, can potentiate the actions of drugs metabolized by these enzymes. Clarithromycin occurs as a white crystalline solid that is practically insoluble in water, sparingly soluble in alcohol, and freely soluble in acetone. It is provided as 250- and 500-mg oral tablets and as granules for the preparation of aqueous oral suspensions containing 25 or 50 mg/mL. The oral bioavailability of azithromycin is good, nearly 40%, provided the antibiotic is administered at least 1 hour before or 2 hours after a meal. Food decreases its absorption by as much as 50%. The pharmacokinetics of azithromycin are characterized by rapid and extensive removal of the drug from the plasma into the tissues followed by a slow release. Tissue levels far exceed plasma concentrations, leading to a highly variable and prolonged elimination half-life of up to 5 days. The fraction of azithromycin bound to plasma proteins is only about 50% and does not exert an important influence on its distribution. Evidence indicates that azithromycin is largely excreted in the feces unchanged, with a small percentage appearing in the urine. Extensive enterohepatic recycling of the drug occurs. 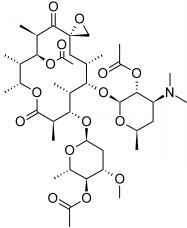 Azithromycin apparently is not metabolized to any significant extent. In contrast to the 14-membered ring macrolides, azithromycin does not significantly inhibit cytochrome P450 enzymes to create potential drug interactions. The spectrum of antimicrobial activity of azithromycin is similar to that observed for erythromycin and clar-ithromycin but with some interesting differences. In general, it is more active against Gram-negative bacteria and less active against Gram-positive bacteria than its close relatives. The greater activity of azithromycin against H. influenzae, M. catarrhalis, and M. pneumoniae coupled with its extended half-life permits a 5-day dosing schedule for the treatment of respiratory tract infections caused by these pathogens. The clinical efficacy of azithromycin in the treatment of urogenital and other sexually transmitted infections caused by Chlamydia trachomatis, N. gonorrhoeae, H. ducreyi, and Ureaplasma urealyticum suggests that singledose therapy with it for uncomplicated urethritis or cervicitis may have advantages over use of other antibiotics. Dirithromycin (Dynabac) is a more lipid-soluble prodrug derivative of 9^-erythromycyclamine prepared by condensation of the latter with 2-(2-methoxyethoxy)acetaldehyde.215 The 9n, 11o-oxazine ring thus formed is a hemi-aminal that is unstable under both acidic and alkaline aqueous conditions and undergoes spontaneous hydrolysis to form erythromycy-clamine. Erythromycyclamine is a semisynthetic derivative of erythromycin in which the 9-keto group of the erythrono-lide ring has been converted to an amino group. Erythromycyclamine retains the antibacterial properties of erythromycin in vitro but exhibits poor bioavailability following oral administration. The prodrug, dirithromycin, is provided as enteric-coated tablets to protect it from acid-catalyzed hydrolysis in the stomach. Orally administered dirithromycin is absorbed rapidly into the plasma, largely from the small intestine. Spontaneous hydrolysis to erythromycyclamine occurs in the plasma. Oral bioavailability is estimated to be about 10%, but food does not affect absorption of the prodrug. The low plasma levels and large volume of distribution of erythromycyclamine are believed to result from its rapid distribution into well-perfused tissues, such as lung parenchyma, bronchial mucosa, nasal mucosa, and prostatic tissue. The drug also concentrates in human neutrophils. The elimination half-life is estimated to be 30 to 44 hours. Most of the prodrug and its active metabolite (62%-81% in normal human subjects) are excreted in the feces, largely via the bile, following either oral or parenteral administration. Urinary excretion accounts for less than 3%. Oleandomycin, as its triacetyl derivative troleandomycin, triacetyloleandomycin (TAO), remains available as an alternative to erythromycin for limited indications permitting use of an oral dosage form. Oleandomycin was isolated by Sobin et al.217 The structure of oleandomycin was proposed by Hochstein et al.218 and its absolute stereochemistry elucidated by Celmer.219 The oleandomycin structure consists of two sugars and a 14-member lactone ring designated an oleandolide. 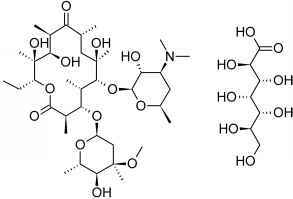 One of the sugars is desosamine, also present in erythromycin; the other is l-oleandrose. The sugars are linked glycosidically to the positions 3 and 5, respectively, of oleandolide. Oleandomycin contains three hydroxyl groups that are subject to acylation, one in each of the sugars and one in the oleandolide. The triacetyl derivative retains the in vivo antibacterial activity of the parent antibiotic but possesses superior pharmacokinetic properties. 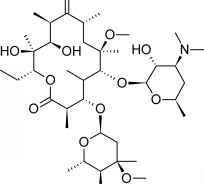 It is hydrolyzed in vivo to oleandomycin. Troleandomycin achieves more rapid and higher plasma concentrations following oral administration than oleandomycin phosphate, and it has the additional advantage of being practically tasteless. Troleandomycin occurs as a white, crystalline solid that is nearly insoluble in water. It is relatively stable in the solid state but undergoes chemical degradation in either aqueous acidic or alkaline conditions. Because the antibacterial spectrum of activity of olean-domycin is considered inferior to that of erythromycin, the pharmacokinetics of troleandomycin have not been studied extensively. Oral absorption is apparently good, and detectable blood levels of oleandomycin persist up to 12 hours after a 500-mg dose of troleandomycin. Approximately 20% is recovered in the urine, with most excreted in the feces, primarily as a result of biliary excretion. There is some epigastric distress following oral administration, with an incidence similar to that caused by erythromycin. Troleandomycin is the most potent inhibitor of cytochrome P450 enzymes of the commercially available macrolides. It may potentiate the hepatic toxicity of certain anti-inflammatory steroids and oral contraceptive drugs as well as the toxic effects of theo-phylline, carbamazepine, and triazolam. Several allergic reactions, including cholestatic hepatitis, have also been reported with the use of troleandomycin. Approved medical indications for troleandomycin are currently limited to the treatment of upper respiratory infections caused by such organisms as S. pyogenes and S. pneumoniae. It may be considered an alternative to oral forms of erythromycin. It is available in capsules and as a suspension. Why erythromycin contains di metyl amino sugar?